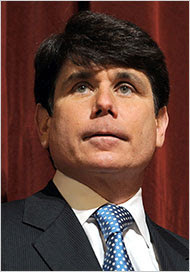 As Mr. Blagojevich mulled the Senate appointment, prosecutors say, he discussed gaining “a substantial salary” at a nonprofit foundation or organization connected to labor unions, placing his wife on corporate boards where she might earn as much as $150,000 a year and trying to gain promises of campaign money, or even a cabinet post or ambassadorship, for himself. In an earlier recorded conversation, prosecutors say, Mr. Blagojevich said he was approached by an associate of “Candidate 5” with an offer of $500,000 in exchange for the Senate seat. This is exactly the type of thing that we were supposed to be fighting against. I hope for either a swift acquittal or a swift guilty plea. There doesn't appear to be much grey area here. Funny how the Bush "Justice" Department manages to root out Democrats while letting blatant assholes like Randy "Duke" Cunningham run scams out of the House while living on a yacht. The Chicago Tribune has posted the criminal complaint in pdf format.